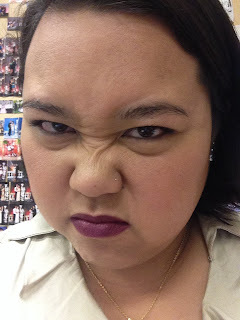 A pretty good dupe for Urban Decay Revolution lipstick in Venom? I have no energy today. Therefore, I present to you... GIFs from Tumblr. 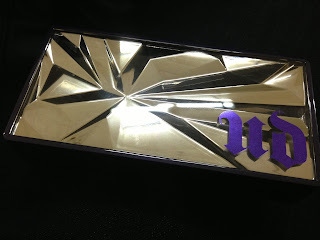 I love Urban Decay Face Cases. 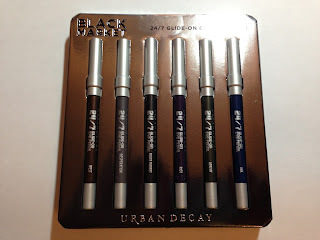 Back in high school, they were among my first high-end makeup purchases, and from then on, I've been an Urban Decay megafan ever since. See this post? I have owned ALL of these. And now I have the newest one, Shattered (which I half-expected to come with the actual eyeshadow color Shattered *shrug*). There is another one, Anarchy, that will be Sephora-exclusive. 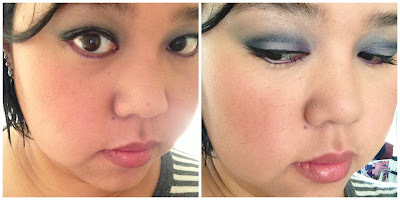 I'll spare you the products shots (because there've already been a LOT posted this week by the big bloggers), and I'll just post the look I'm wearing today with all five shadows. Wait, what? Oh, it's only September. Well, it FEELS like Christmas, because Urban Decay's Holiday 2013 collection is dropping this Tuesday (9/10). Except that apparently Ulta already has a couple of fancy schmancy new items available for purchase today, including the Black Market eye pencil set, which features 6 travel-sized pencils, 5 of which are new/exclusive colors, and the one that isn't new/exclusive is new-ish, in the sense that it was one of the new colors UD released when they re-released their line of eye pencils (so, it's not a color that has been around for years). I was already at Ulta anyway, returning a couple things. I saw the set... It was inevitable. After seeing this photo of swatches from Amy of Sugarpill, I knew I had to try one. And the one I wanted the most was Toxic, the deep plummy purple shade. As you can see, the packaging and stuff is really cute. The tip of the lipgloss has some pretty swirly-funnel thingy in it that looks really pretty, and the color is visible through the tube. The gloss is REALLY pigmented. That was one swipe on my hand. The texture is light and slick, and not sticky. To me it is more like a liquid lipstick than a gloss, but, you know, not quite a liquid lipstick. It's like OCC's Lip Tar but with a little less staying power (wipes off cleanly and easily and leaves the faintest of stains). There's a faint sweet scent if you sniff the wand (which I did, and is that weird? ), but I didn't notice much scent or taste when I wore it. So now that I've had a little time to play with it, I can finally express some thoughts on Sugarpill's Cold Chemistry palette. But the other three shades are SUPER soft and pigmented - in fact, I tried to use just a touch of Soot & Stars in my crease, and even just the light touch gave me almost too much product :) Elemental Chaos is my favorite of the four (surprise, surprise, it's purple), and Subterranean is gorgeous, but I haven't used it much because it's darker than I'm used to. I'm not going to do an in-depth review, but I did want to jot down some thoughts, since I went to go see it yesterday. I haven't talked about the book series before on my blog, but I will just issue a spoiler warning right now in case you haven't read them. Because I will spoil EVERYTHING. 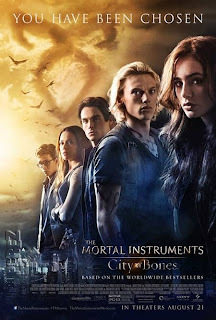 So, first, a (relatively) quick overview of the books: City of Bones is book 1 in the Mortal Instruments series by Cassandra Clare. There are currently five books total, with a sixth one on the way, and essentially these are structured as two trilogies. The movie is based on the first one. Awwwww yeah. 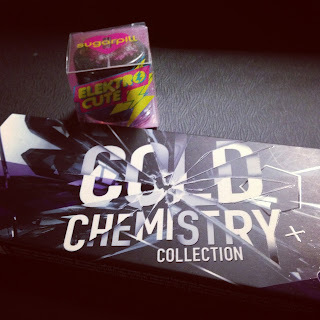 Payday means that I can finally get the much long-awaited Cold Chemistry palette from Sugarpill (I feel like bloggers started talking about this over a YEAR ago), and while I was at it, I was curious about the new Elektrocutes neon colors, so I ordered Hellatronic, because it's the one I'd most likely wear (being purpley). Look, here are some photos. I like new packaging of the palettes by the way - not just this one, but the previous square-shaped palettes - instead of coming in a box, they come in a paper sleeve. That's what I took pictures of above. As always, I am the MOST excited about the purple shade, Elemental Chaos. 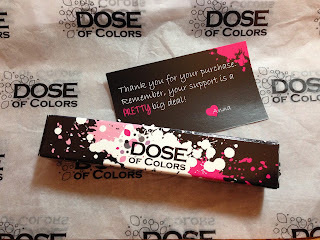 But they all look stunning, and are darker than Sugarpill's usual fare, bright, dayglo colors.